Healthy Chocolate Coconut Truffles have the delicious flavors of dark chocolate and coconut…all coming in around 60 calories and without any added sugar of fat. They are made using only 3 main ingredients (plus an optional ingredient which helps to deepen and intensify the chocolate flavor). Even better – they take only minutes to make. Intrigued? I certainly was when I first found the recipe but it took me over 9 months to make them. I am kicking myself that it took so long…they are so amazingly good! Thankfully, it is time again for the second installment of the Eating the Alphabet Challenge, hosted by Brenda of Meal Planning Magic. Participating in this challenge was the extra push I needed to make these truffles. This month we’re featuring healthy recipes using fruits, vegetables, grains or legumes that start with letters C or D. Since Healthy Chocolate Coconut Truffles feature both coconut and dates, I’ve got both letters covered this month. Put dates, cocoa, 3 tablespoons coconut and espresso powder in a food processor and puree until smooth. If mixture is too dry, add water by the teaspoonful (I needed about 3 teaspoons). If mixture becomes too wet, add more unsweetened coconut. Scoop mixture by the tablespoonful and form 1-inch balls. Roll balls in remaining coconut. Chill/store in refrigerator until ready to enjoy. With Halloween just around the corner, the excitement is building for fun costumes and candy. We always somehow end up with more candy than we need to give out (thanks to the person who buys the candy, *ahem* Mike). While that may be intentional, I’m always happy to try new and tasty recipes using “leftover” candy ~ these Mounds Brownies being one of them! Mounds Brownies take a basic brownie recipe and dress it up with coconut, simply by adding Mounds candy bars. It’s amazing how such a simple addition can really transform an otherwise ordinary dessert into something unique and seemingly decadant. You get a nice-sized chunk of candy bar in each brownie, and fans of chocolate and coconut will enjoy the complementary flavors. By the way, it’s that time of week again. We are now in Week 5 of the 12 Weeks of Christmas Treats! While this recipe is shared in part to use up Halloween candy, these Mounds Brownies would be a super fun addition to your holiday treat platter. They’re something a little different yet delicious and very easy to make too. Preheat oven to 350 degrees. Spray 8-inch square pan with baking spray and set aside. Melt butter and chocolate in a bowl set over a pan of simmering water (or a use double-boiler), stirring frequently until melted. Remove bowl from heat and let cool for a few minutes. In a separate bowl, whisk the eggs and sugar until well-blended. Stir in vanilla and chocolate mixture. Fold in flour mixture until combined. Pour batter into prepared pan. Place Mounds bars on top of batter, pressing down slightly. (I did 3 rows of 4). Bake until just set, about 30 minutes. Let cool completely on wire rack. Well hello there. Look up, and please update your bookmarks! That’s right. Alida’s Kitchen has a new web address. I dropped the ‘blogspot’ from the URL, so it is now www.alidaskitchen.com. I purchased this domain many months ago and was waiting for the right time to pull the trigger. Since my physical kitchen has a new address (we moved! ), it seems like a fitting time to make the switch. I will do whatever I can to make sure this transition is seamless, and as always I welcome your comments and feedback. 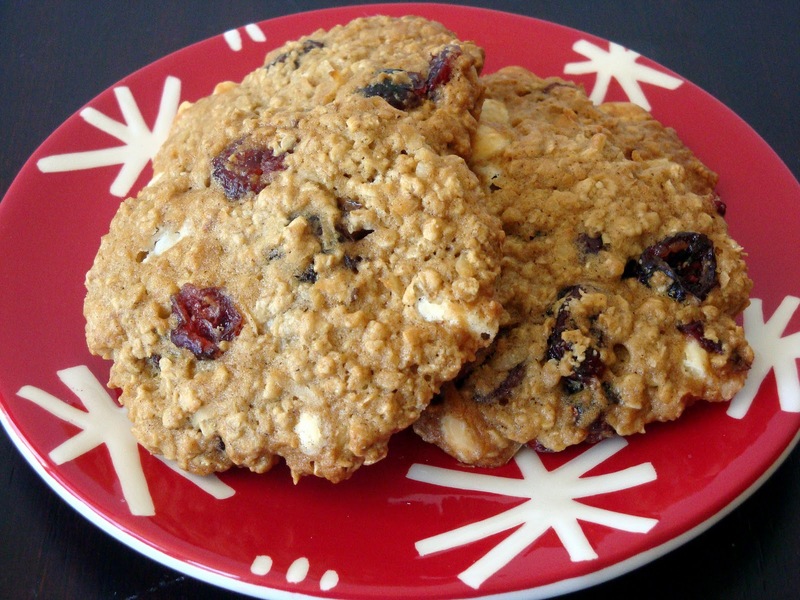 So enough about that, let’s get on with today’s recipe – White Chocolate Coconut Cranberry Cookies. 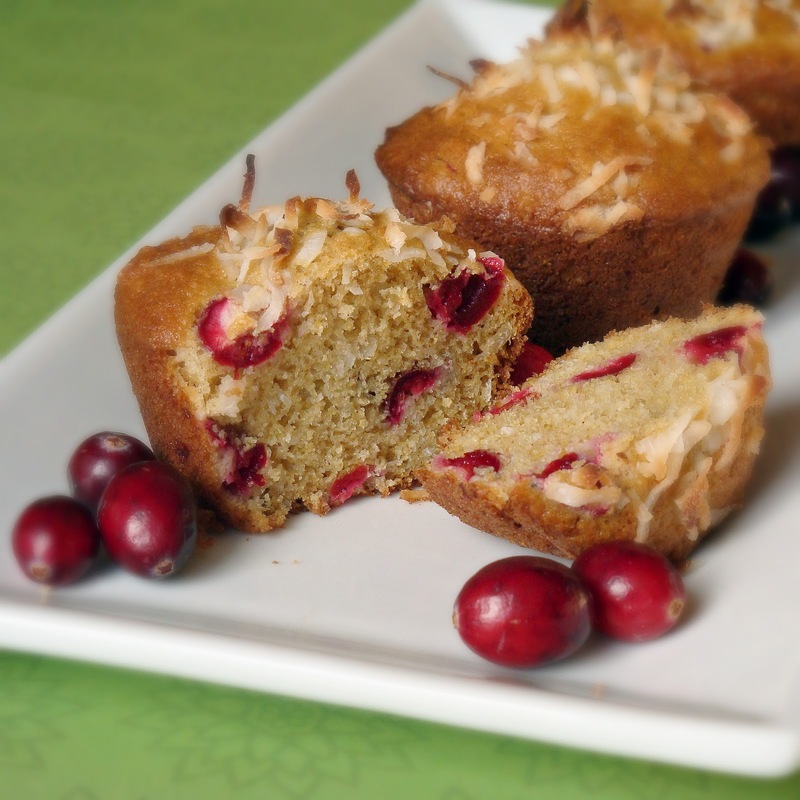 Who doesn’t love the classic pairing of white chocolate and cranberry. The sweetness of the white chocolate against the tartness of the cranberries is just delicious. 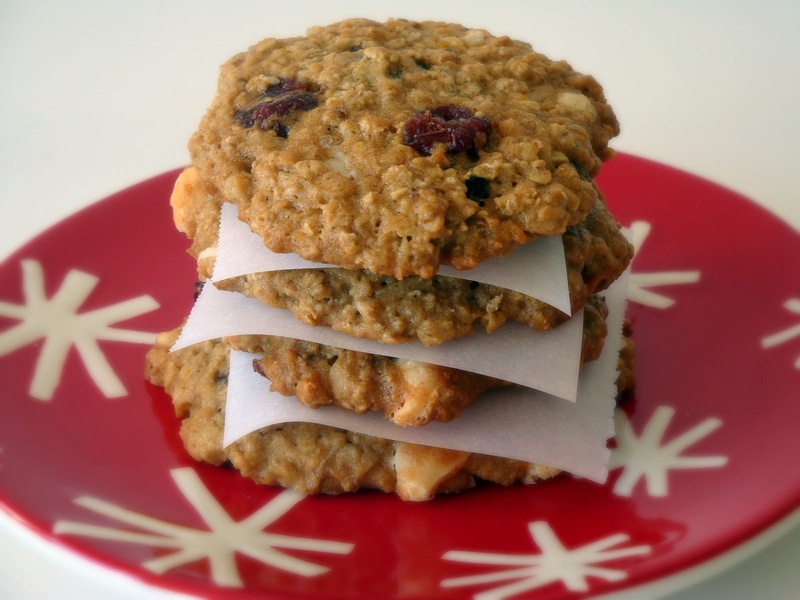 The coconut adds a little something extra special, and the oats give the cookies a chewy texture. All together, we have a tasty combination that is a fun and festive addition to your cookie plates this holiday season! In a small bowl, whisk together the vanilla, milk and eggs. Set aside. Using a hand mixer or a stand mixer, in a separate bowl, on medium speed, beat butter and both sugar until light and fluffy. Reduce speed to low and add in milk mixture – beat well. Add the flour mixture and beat until just combined. Stir in the oats, cranberries, coconut and white chocolate chips. Place dough in refrigerator until firm (at least 2 hours to overnight). Preheat oven to 350 degrees. Line baking sheets with parchment paper, and set aside. Shape 2 tablespoons of dough into a ball and place on parchment-lined baking sheet. Repeat with remaining dough, placing 3 inches apart. Press with the bottom of a glass (covered with parchment or waxed paper) to flatten dough. Bake until golden but still soft in the middle, 15-18 minutes. Remove from oven and move to a wire rack to cool completely. Healthy Peanut Butter Balls are an addictive, no-bake snack, made from simple ingredients found in your pantry. It is no secret that I love peanut butter. So you can imagine my excitement when I was selected to participate in the Foodbuzz Tastemaker program with the National Peanut Board. The task was to create a snack recipe using peanut butter and incorporating other ingredients found in most homes. Easy enough! I wanted to make something healthy, convenient and easy. I also wanted to make something with oats. It was time to roll up my sleeves, grab ingredients from the pantry and experiment. After adding a little here, a touch there,…voila! I finally got the results I was looking for, using simple wholesome ingredients found in my pantry. This healthy snack could not be any easier to make. The recipe requires no baking; simply measure, mix, roll and chill. The mixture may seem a little dry at first, but as you continue to mix it comes together (or add a little more honey or peanut butter to moisten the mixture to a consistency that works for you). Rolling the balls in a coating as optional. It makes the balls a little less sticky on the fingers, and also is a fun way to vary the flavors, but it is not necessary. Healthy Peanut Butter Balls are a healthy and delicious snack, or even a quick breakfast on-the-go, featuring one of my favorite foods of all time…peanut butter! Heat peanut butter and honey in the microwave until easily mixed, about 15-20 seconds. Stir until blended. In a separate bowl, mix oats, flaxseed and coconut (if using) until combined. Add peanut butter mixture to oat mixture and stir until incorporated. (Mixture may seem a little dry at first…just keep mixing). Form a rounded tablespoonful of the combined mixture into a ball and place on a plate. Repeat until all mixture is used. Now, if you do not want to coat the balls, skip to step 6. Roll each ball in whatever coating suits your preference. Cocoa powder, powdered sugar, wheat germ, cinnamon sugar and chopped peanuts are some ideas. Disclaimer: As part of the Foodbuzz Tastemaker program, I was provided with 2 jars of Planters peanut butter, from the National Peanut Board, for free. The details of my experience are exclusively my opinion, and I was not otherwise influenced or compensated. Have you heard the buzz about coconut oil? It seems to be all the rage these days. Everywhere I turn there is another article about the health benefits of coconut oil. As someone who likes to keep up-to-date on healthy food trends, I’ve been interested in trying it. So when I was contacted by Kelapo to sample Kelapo’s Virgin Coconut Oil, it was like they read my mind. I first visited Kelapo’s website. There is a wealth of information there regarding the benefits of coconut oil. I found the uses section particularly helpful for a newbie to this product, as it explained that you can replace the butter/oil at a 1:1 ratio, and that it is helpful to warm it up when replacing oil in a recipe. Great tips! I definitely wanted to bake something using coconut oil, but I had so many ideas swirling about, it was hard to choose. 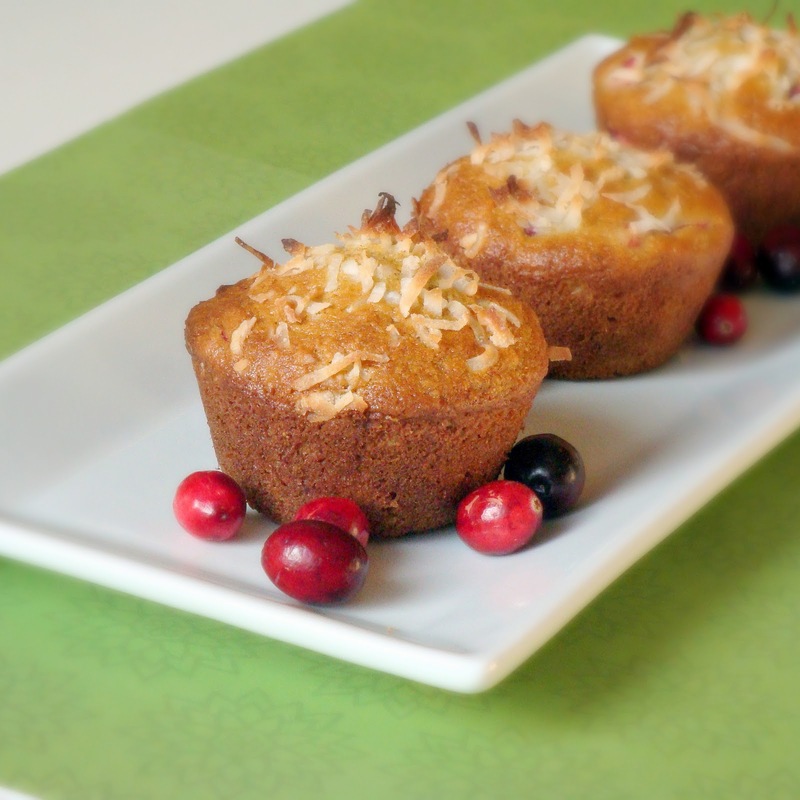 I decided to put a little coconut twist on muffins, a recipe that I will share with you tomorrow. The result? These muffins were amazing! We loved the flavor the coconut oil imparted on the muffins, and they were very moist and had a nice texture. Kelapo’s coconut oil was very nice to use as well. I am more than pleased with my first coconut oil experience using Kelapo’s coconut oil, and I look forward to sharing more recipes using coconut oil with you. One more thing! The generous folks at Kelapo have given Alida’s Kitchen a discount code to share with you! From now until 10/20/2011, use the code ‘Alida20’ (case sensitive) to receive 20% off your order. Pretty sweet! Disclaimer: Kelapo sent me a jar of their Virgin Coconut Oil for free. The details of my experience are exclusively my opinion, and I was not otherwise influenced or compensated.